. . .For some time the deafening sounds continued. From the window they could see people running for shelter in every direction. A man came dashing down the street; dodging falling tiles as he ran, and burst into Madame Coudert's shop. He had just come from the Rue Colbert and had news to tell. "The Boches have sent an emissary to the Mayor to demand huge supplies of provisions from the City, and a great sum of money besides," he told them, as he gasped for breath. "They are shelling the champagne cellars and the public buildings of the City to scare us into giving them what they demand. The German Army will soon be here." In a few moments there was a lull in the roar of the guns, and then in the distance another sound was heard. It was a mighty song of triumph as the conquerors came marching into Rheims! Not sure if I ever read this one before. I only just realized how many of these stories are set in times of war. 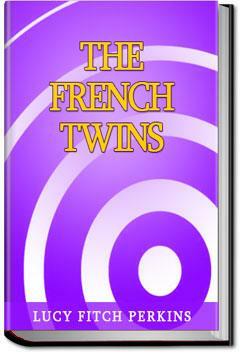 This one is the First World War (Great War, when it was written) Of course the twins save the day, as always! A story for children about the First World War close to the front line on the French side. This book is a quick read and manages to be child friendly in a situation which, almost certainly, was far worse than described. As an adult, I found this rather an over optimistic portrayal. The book borders on overly sweet. That said, its a good reader for the younger set. Full of good, clean, adventure with just a smidge of history to round it off.